Trinity Church, Boston, was completed in 1877. Its architect was H. H. Richardson, and numerous artists and craftspeople contributed to the interior design. In 1971, Trinity was designated a National Historic Landmark for "possessing "exceptional value in commemorating or illustrating the history of the United States." The word for fish in Greek is ICHTUS, which represents the first letter of each Greek word of Jesus Christ our Lord and Savior. Three fish are symbolic of the three days that Jonah spent in the belly of the whale, which prefigures Jesus' three days from death to resurrection. 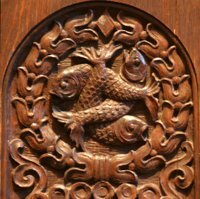 This wood carving is in the chancel area of Trinity Church, Boston. Trinity Church, Boston - Ichtus, from Art in the Christian Tradition, a project of the Vanderbilt Divinity Library, Nashville, TN. http://diglib.library.vanderbilt.edu/act-imagelink.pl?RC=51494 [retrieved April 20, 2019]. Original source: Collection of Anne Richardson Womack.